I saw Garret for the last time when, last July, I accompanied him to his car outside the Highlands Hotel in Glenties and made sure that he was comfortably installed in it for the drive to Dublin. 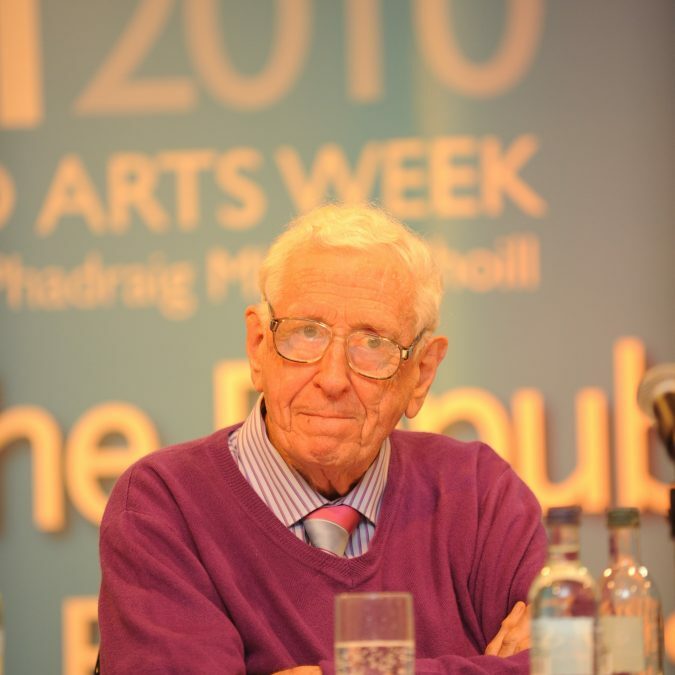 The previous evening, when he officially opened the MacGill School I introduced him as ‘a national treasure’. I suppose that I had a vague feeling that he would not be returning to the School which he had frequently graced with his presence and enriched with his intellect. It is a phrase, of course, that has been used by President McAleese in recent days and even though it was perhaps slightly odd to use it in Garret’s presence I am now glad that I did. We realise that we have lost a man who cannot and, in all probability, will not be replaced for he was unique in Irish life. Garret was an original of which there are no copies or prints. It really does not matter whether or not as Taoiseach he allowed cabinet meetings to run on interminably or failed to confront adequately our economic crisis in the eighties(his coalition partners at the time, the Labour Party, must take a considerable part of the blame) or, on at least one occasion, wore odd socks and shoes. At the end of the day he was ‘Garret the Good’ even though the term, when first coined, was intended to be sarcastic and spiteful. It was Ireland and its people whom Garret wanted to serve, selflessly and without fear or favour. As a politician he may not have been good at small talk or kissing babies or delivering planning permissions or medical cards and other such favours to constituents but he was a true visionary who knew the kind of Ireland he wanted to bring about. Where Ireland and its people, North and South, were concerned, he was unrelenting in his efforts, through his thinking, his writing and his actions, to improve life for all on this island. As the British Prime Minister, David Cameron, said last week, he was in politics for all the right reasons. This was so evident again in Glenties last July when Garret, officially opening MacGill, gave vent to his anger when calling for reform of our political system. He had come to the conclusion that our present system, characterised by extreme localism which fosters clientelism and results in inadequate politics and politicians, had led to our grave economic crisis. It was moving to see this elderly statesmen in his 85th year express, with such conviction, passion and vehemence, his anger and disappointment at the way in which our economy was allowed to go on the rocks (Garret’s address is now available on YouTube). His body may have been increasingly showing the signs of age but his ardour, his courage, his honesty and his persuasive powers had not dimmed. It is interesting to reflect on the question as to whether or not our bankers and developers would have been allowed to run riot and our regulators fail so abjectly in their duties had Garret Fitzgerald still been in charge. Personally speaking, I do not think that they would. He had such insights into the Irish economy, North and South, right up the very end, and his column in the Irish Times bears witness to that, and such understanding of the forces at work in society-forces that ultimately brought about our economic collapse. And let us make no mistake about Garret’s obstinacy and determination to pursue policies once he had decided that they were the right policies. He may have been kind, courteous and gentlemanly but a pushover he was not. He did not suffer fools gladly. It was as Minister for Foreign Affairs that Garret excelled. Given the portfolio in the Coalition Government of 1973-7 by Liam Cosgrave when we had just joined the European Economic Community, our relations with Europe and indeed with the rest of the world were revolutionised and our international standing enhanced. It was an inspired choice. Garret, for many who worked with him in Iveagh House, was and would always be the best Minister for Foreign Affairs that we ever had. Passionate about Europe, its languages and cultures, it was during this time that he forged friendships with European leaders which benefited the country enormously as it strove, very successfully, to build its infrastructure and raise the standard of living of its inhabitants. Garret, slightly eccentric perhaps but intellectually and culturally confident and assured, established our credentials as a country to be taken seriously and which, even though it needed substantial subsidies, was considered to be a very positive addition to the European group of nations. The French, in particular, liked him and respected him and he, of course, knew and loved France. The work that he did in those few years would stand to us in the decades that followed and would give him status and prestige which would enable him later to deal with our most intractable and debilitating problem, that of Northern Ireland. As we saw in the referenda on the Nice and Lisbon treaties, he remained throughout his life passionate about Europe and adamant that the only place for Ireland was firmly in Europe. It was in his understanding of the North and its people in both communities as well as his passionate search for a settlement from early on in ‘the troubles’ that Garret came into his own. As is well known, his family background gave him particular insights into the Northern problem at a time when most people in the South had never set foot on the other side of the border. In the little volume he wrote, Towards a New Ireland, published in 1972, his great intellect was brought to bear on finding a solution which would end violence for good. In it he argued, in fact, for a united Ireland but which would be a different Ireland with profound changes in society on both sides of the border. The transformation of society which he envisaged would make the new Ireland acceptable to all Irish men and women. His Ireland was that of Tone and Davis. His analysis from a religious, social and economic perspective was characteristically intelligent, objective and dispassionate, albeit unrealistic at the time with death and destruction on the streets of the North and passions running high. Hugely influenced by John Hume’s thinking on the North throughout the 1970s and 80s, Garret continued his search for a constitutional solution-a search which culminated in the Anglo-Irish Agreement signed at Hillsborough in 1985 by the British Prime Minister, Margaret Thatcher and himself. It was a diplomatic triumph and a major step forward even though it led to total disenchantment among the unionist population who felt betrayed by both governments and, shockingly at the time, opposed by Fianna Fail led by Charles J. Haughey. I remember this time as being very trying for Garret who was somewhat taken aback by the reaction of unionists in the North including moderates like the late MP Harold McCusker who told me emotionally and bitterly that he would never set foot in the Republic again. But in spite of all the violence and all the opposition to it much was to flow from that Agreement in the following two decades for it created a radical new approach to the Irish problem in London and Belfast. Queen Elizabeth’s extraordinary speech in Dublin Castle last week must have brought tears to Garret’s eyes as he lay in his hospital bed. He was a remarkable man and he was married to a remarkable woman, Joan. Together they formed a formidable force, an intellectual powerhouse, and were devoted to each other. There was no more moving experience than to see Garret take care of Joan when she became seriously ill at the beginning of the nineties. I and many others felt that he would have difficulty in continuing on with his writing and his many other post-politics activities after Joan’s passing but thankfully he did and our society was all the richer for it. But I think the outpouring of grief which we have seen at every level of Irish society since last Thursday has as much, perhaps more, to do with the trust that he engendered in people and with the fact that he had enormous integrity at a time when our political life became tarnished and sullied by others. There were no brown envelopes where Garret was concerned. He was fundamentally an honest man and a simple and generous man. He really had little, if any, interest in material goods or even in his own material welfare. Ideas and improving our society were the things that drove him. Social justice was another. He longed for a fair society in which all the children of the nation would be cherished equally. Alas, he would never have the luxury while in office to have the necessary resources to better the lives of the underprivileged and this disappointed him greatly. As he told John Bowman a few years ago, he felt so keenly and painfully the scourge of emigration and the fact that our young people had to leave their own country to make a living elsewhere. That had special resonance for me and, I am sure, for so many others in Donegal and throughout Ireland. He was, as Enda Kenny has said, an institution. He was, for me, an Irish institution and a very rare and precious one and its passing has left us the poorer. We will miss him terribly. Ni bheidh a leitheid aris ann.